Discussion in 'Exploring everything under the sun!!' started by toypaseo, July 3, 2011. Been having some hail storms within the last few weeks lately. These are the largest ones I have seen around here though. Explorer was in the garage, since I was waxing it. I pulled the g/f's Accord in when the hail started getting larger. I covered my Paseo's roof with a new moving blanket I "borrowed" from work, and pieces of a Rubbermaid outdoor storage unit that I got for my brother covered the hood and trunk. Still got a few dings from what was not covered. Notice that some of the hail has some clear areas. The ice part is just like a nice rock falling from the sky. Some of the dings in my Paseo are from a past hail storm in the area, but the hail was pea to marble size, almost all were 100% clear, and still making dents even though I was parked under a giant tree hoping for the best. 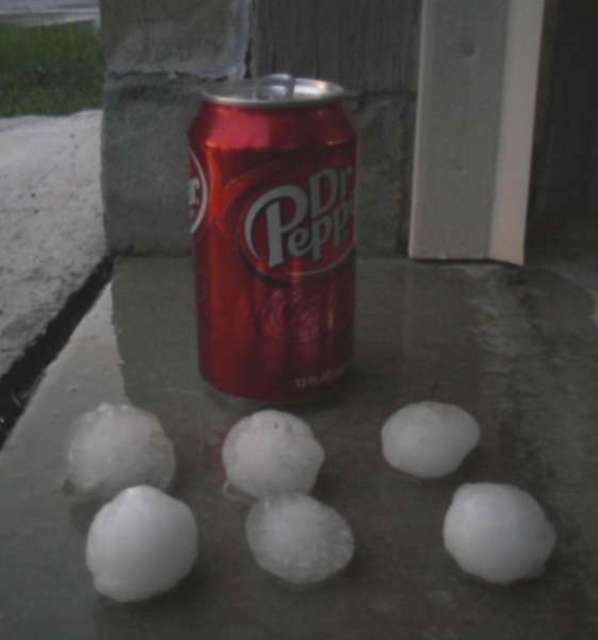 Dr. Pepper can usage was just a coincidence, and there to show size of hail. Wow...that's intense. I hope I never have that at my apartment - nowhere to pull my truck in safely.